A new musical based on the life of Tina Turner is set to open in the West End in 2018 - and the singer even came out of retirement (somewhat reluctantly) to work on it. "Retirement is wonderful," Turner says as she launches Tina: The Musical in London. "You sleep long, do what you want, decorate the house two or three times. Just easy things that you dreamt about when you were working and that's all you did." She says her lifestyle when she was famous involved spending most of her time on tour buses, planes and cars, adding: "That was work and that's sometimes what you had to do. "But you had a dream not to have to do any of it." Turner, whose hits include The Best and What's Love Got To Do With It, was initially reluctant to sign up for working on the show, which opens at London's Aldwych Theatre in April. "I didn't want to because I didn't really understand it or agree with it, whatever there is - the magic between stage and music is totally different," she says. "So I'm learning and experiencing what musicals are about." The producers of Tina had to fly out to Switzerland, where Turner now lives, to convince her to give the project her blessing. Turner was eventually won over, and now comments: "This took me out of retirement... I'm very excited to be a part of it." But the big question of course, was who was going to play Tina in the show. This week, the theatre world got its answer: Adrienne Warren. "She can sing," Turner says. "She will do the dancing. Maybe she hasn't done the type of dancing that me and my girls would do, but she can do that. She's pretty. And we're giving it a try." Giving audiences a flavour of what they can expect, Warren performed three songs at the launch, including two duets with Turner, proving in the process that she definitely has the voice to pull this role off. Speaking after the performance, the Virginia-born actress said: "She's a motivation, inspiration to all women, and especially women of colour. "It's the first time I ever realised that I could grow up in the South and have dreams that would take me all over the world. I wouldn't have become a performer if it wasn't for Tina Turner." 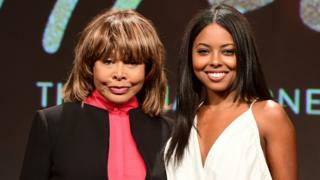 Image caption Adrienne Warren said audiences will find the musical "inspirational"
She adds: "When you haven an opportunity like this, I call it a responsibility. Because I'm a Tina Turner fan first, so that's a responsibility and I don't take that lightly." Details of the plot and songs included in the show haven't been announced yet, but producers say it will be a fairly comprehensive telling of Turner's life story - not shying away from issues such as the domestic abuse she suffered at the hands of her husband Ike. Describing the show's content, Adrienne said: "Dark? No. Inspirational? Yes. It is the truth of her story. Sometimes the best things in life come out of the worst things in life, so that's what's so appealing about this show. "There are challenges, the stamina that is required for this show was something like I've never seen before, and actually having Tina as my coach as I do this is something quite interesting as well, so I love every second of it. "It shows all of us that no matter what obstacle comes your way, whether it's your family not supporting you, whether it's bullying, domestic violence, don't ever let that stop you achieving your dreams."